Series 1 – Boys Will Be Boys. 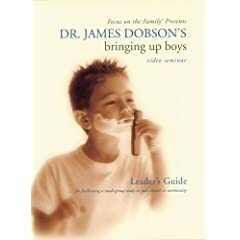 For those who have boys at home, I would recommend you get this parenting VCD. It teaches you how to raise boys, not that you don’t already know. It enhances your skills I suppose. It is conducted by the famous Dr. James Dobson from Focus on the Family. It is a 60 minutes show and plenty of good illustrations. It cost RM19.90 per VCD and RM200.00 for the whole series. I enjoyed part 1 & part 7 and I will get the entire series. In first part of the series, it tells you how boys are created differently, even from the making in the womb. How the testosterone floods the womb and this hormonal bath alters the way boy’s brain are structure in many ways. The connections between the two hemispheres of the brain are actually damaged. As a result, boys have a harder time integrating and articulating what they know, feel and believe. Boys and Girls are different. How many of you find that when you are talking to your husband and he is not listening? Men/Boys have the ability to filter things that they do not want to hear. I often find that true. Dr James Dobson has one very useful method, is when you want to communicate something important to your boy/hubby, touch him with yr hand and look him in the eye, you will get his full attention. One illustration he gave, a father who tried to make his son drink milk and he refused. He asked him 7 times and he refused. Later the father thought that he has a competitive characteristic in him. He told the son, let’s compete and see who drinks the fastest. He divided the milk into 2 glasses and on the count of 3, both finished the milk. Next the son told the father, let’s make it 2 out of 3 wins. Parents do need to be creative, these days. If I recommend this vcd for him, sure he said he is more creative than the dr! do they have one for girls? I pretty sure I need one for my girls. I like para. 5. Maybe I should try dat on my hubby cos sometimes he doesn’t seem to be paying attention to me when I’m speaking to him. For e.g. when I said I something, he would always be asking me to repeat what I had said or he would say “What did u say just now?” Sometimes I would just say “Forget it!” Even his daughter would say “Pappy, do u know what Yau Yau is saying?” …. sigh …. HEHE..I ALWAYS GET IRRITATED BY MY HUBBY ESPECIALLY WHEN I AM TALKING TO HIM. SOMETIMES, EVEN BY TOUCHING HIM ALSO DOESN’T SEEMS TO WORK. So glad to know that I am not the only one having hair pulling days with my ‘suspected of hearing problems’ boys ( 1 big and 2 small). Egghead, Jazz: I can loan you my copy if you want. Tracy, Sabrina, MagicTree: We are in the same ship, I bet there are many of the same kind. I used the same trick when my son refuse to put back his toys. Nowaday parents need so creative to teach the kids, cannot just scold and beat them.